Our new issue features work by Jordan Hartt, Valerie Fox, Sean Kearney, Dan Bruskewicz, M.G. Piety and Don Riggs. We hope you’ll enjoy the new issue and join us in looking ahead to the new year. Submissions are now open. 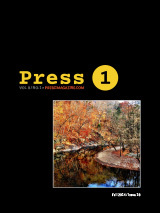 Please send PDF versions of your work to elizabeth@press1magazine.com, and include a short bio (about 50 words). Plans for 2015 include expanding our staff so we can handle more submissions and release issues more regularly. More announcements coming soon! Thank you for your continued support. "Making Things Out of Words"
"A Review of Miriam Kotzin's The Body's Bride"
Copyright © 2014 Press 1 Magazine.